I’m trying something new. Most of the time when I’ve blogged, I’ve labored over my posts, wanting them to be just so. This post, however, I’m giving myself only half an hour to write it; just getting my thoughts down and posting it for the world to see. I’m giving this a try because my schedule isn’t giving me much time and I want to see if I can post something without making it an arduous process. 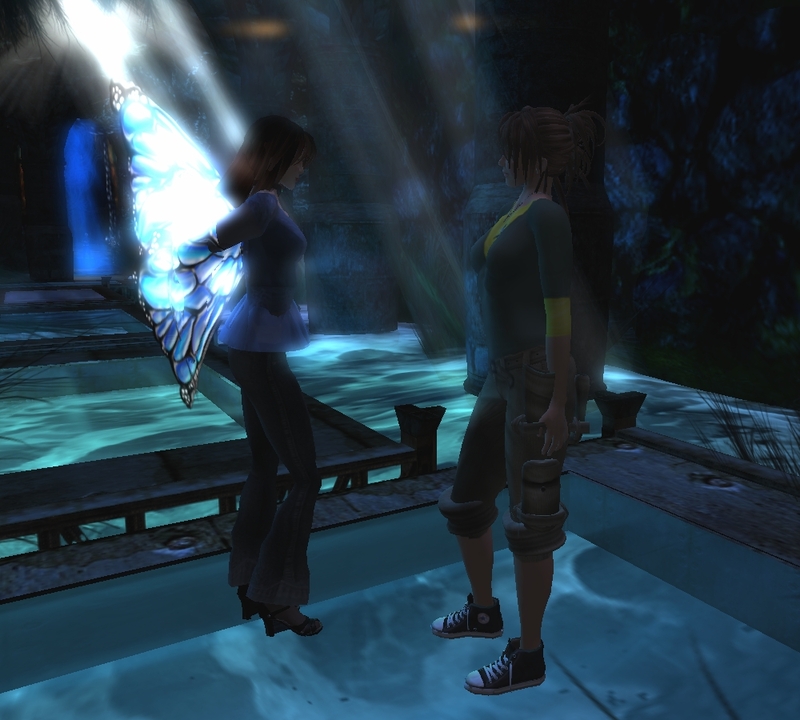 This morning I read a wonderful post by my friend Chestnut Rau that included some of her perspective on trust in SL. As I read it, one of her key points was that trusting people enough to regularly let them in was something that didn’t come naturally to her. I couldn’t help but read that and think about my own journeys of trust and intimacy in the virtual world. Initially I likened the intimacy that comes with pseudonymity in SL to meeting a stranger on a plane. You sit next to someone, exchange pleasantries, and sometimes you find a surprising conversation where people are divulging all sorts of details about themselves that you would have never imagined. Then you get off the plane and never see each other again. My first experiences in Second Life were similar to this; I met wonderful people and shared surprising nuggets of myself. But then some funny things happened; I found that I got quite good at being an intimacy junkie, looking for a fix that comes with sharing something deep with other people. I coupled this, however, with a unique ability to keep many people at an arm’s length that comes with having a virtual identity. I found pseudononymous intimacy to be powerful but it was tempered by my own anxieties about too closely linking the atomic and digital worlds. Yet as time wore on, like any junkie, I found the fix got harder and harder to satisfy. I found myself getting less satisfaction from virtual intimacy and decided to start trusting and let down the veil of pseudonymity. The gist of all this? I’m not exactly like the people on the old American Express ads, but I have gotten to know quite a few people. Yet like our first lives, we recognize that a much smaller circle of people are worthy of trust. I’m glad I decided to trust people and move toward a deeper and more genuine intimacy. The experience has undoubtedly made both my first and second lives richer. But what is it for you, dear reader, have you found people you could trust to share intimately all of yourself in Second Life? Or, more simply put, the more people have to work to keep their first and second lives separate, the shorter their second life. No, I’m not talking about people who don’t divulge their first life name, because that is probably 90% of SL Residents. I’m talking more about the avatars who avoid acknowledging that they even have a first life. If you’ve been around SL, I’m sure you’ve met the type; these are people that avoid sharing they had awful day at work for fear that someone might ask them what they do. This is more about being so cautious that the person refuses to share contextual information as friendships develop. Half the people in SL have something to the effect of “SL is SL and RL is RL” in their profiles, but I would venture to guess that the majority of them share some of their RL with people they’ve grown to trust. Let’s be clear, I’m not judging here; at various points in my Second Life experiences, I’ve worked hard to keep them both separate. While Second Life allows us to explore boundaries, create and do things that we might not be able to do in the atomic world, we really only have one life to live. More accurately, I think it is often a process of realization that to maintain it all, one must find ways to be comfortable integrating all of these experiences together or risk burning out. I would love to hear your two cents on this. Do you feel you had to find a way to integrate all these aspects of your life? Or, for those of you who work to keep them apart, has it felt challenging to do so as time passes?